I am having an overreaction to all the color on the blog lately. I have worn more pink in the last month than I have in my entire life. Therefore, my inherent oppositional streak is getting kicked into high gear. 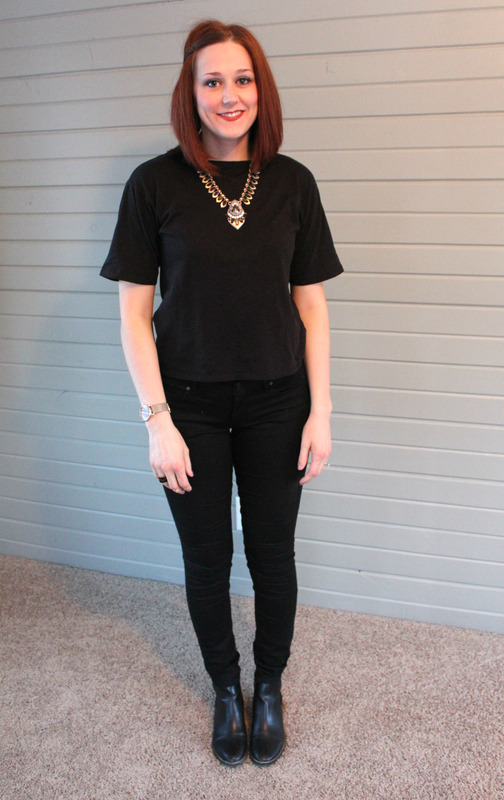 Enter today's post: all black from head to toe. I cannot tell you how much I love wear all black. I feel chic, I feel New York, I basically feel like Kelly Cutrone (if you don't know her look her up because she's baddest chick ev-ah). I know some people feel weird about it but it is so natural to me. What's wrong with black? Nothing. It's slimming, chic and goes with everything. Win-win for this gal. I decided to buy these jeans because the blue jean leggings I bought from Gap have basically not left my body. They have become and extension of my self and although that may seem bizarre go buy yourself a pair and tell me you don't love them. I dare you. So I thought I'd purchase them in black because the other black jeans I have are on the shorter, Fall and Spring side. I will warn you I bought longs in the black jeans when I did not in the regular blue jean. For some reason the black jeans were shorter. 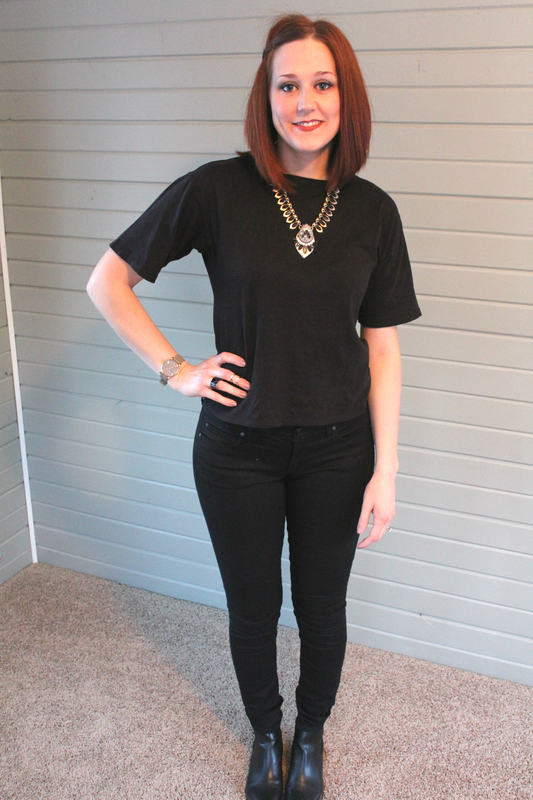 To give you a reference I am about 5'8" and the longs bunch up just a little around the ankle when the regulars were somewhat a "preparing for flood" type of length ;) While at the Gap I saw this great black crop top. It's so comfy and I love the longer sleeve as almost a boyfriend take on this tee shirt. I paired this with this amazing necklace I got at Primp. I love how elaborate it is and think it adds some depth to this monotone look. Lastly, I added my Sam & Libby boots from Target. I really love the clean lines of these and think it perfectly caps off the head to toe look. What do you think of this look? Would you wear all black?